"is a 2012 UK-American fantasy and action film based on the German fairy tale "Snow White" compiled by the Brothers Grimm. The film is directed by Rupert Sanders and written by Evan Daugherty, John Lee Hancock, and Hossein Amini. The cast includes Kristen Stewart, Charlize Theron, Chris Hemsworth, Sam Claflin, and Bob Hoskins (in his final role before retiring from acting). The film received two Oscar nominations for Best Visual Effects andBest Costume Design at the 85th Academy Awards." still blooming in the snow. And then she gave birth to Snow White, who became the Princess of Kingdom Tabor and daughter of King Magnus. after rescuing her from the Dark Army, an invading force of glass soldiers. Ravenna, who is in fact a powerful sorceress and the Dark Army's master, ..."
"another 2012 film based on the tale of Snow White with Lily Collins as Snow White and Julia Roberts as the Queen." 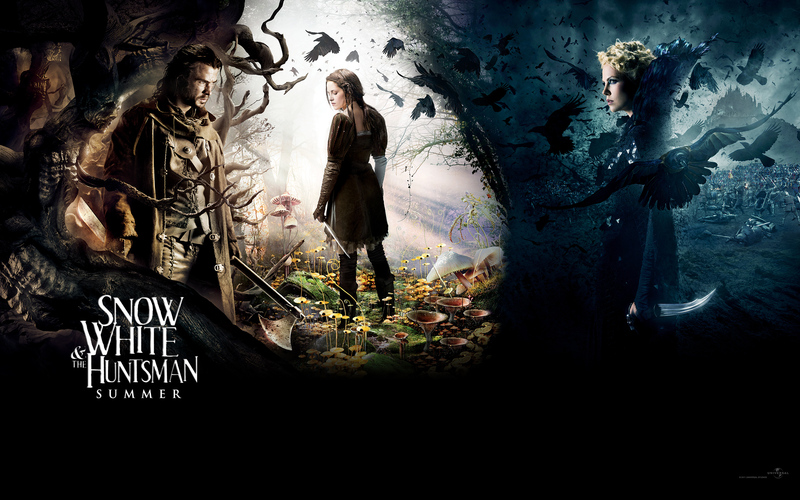 "Here is a simple trailer exercise to practice listening from "Snow White and The Huntsman." This is probably easier than intermediate, but I hope you enjoy it."